The husband-and-wife duo of Jay Rattman and Janet Sora-Chung will perform Friday, Feb. 1, at 7:30 p.m. in the Houlihan-McLean Center. Admission is free. 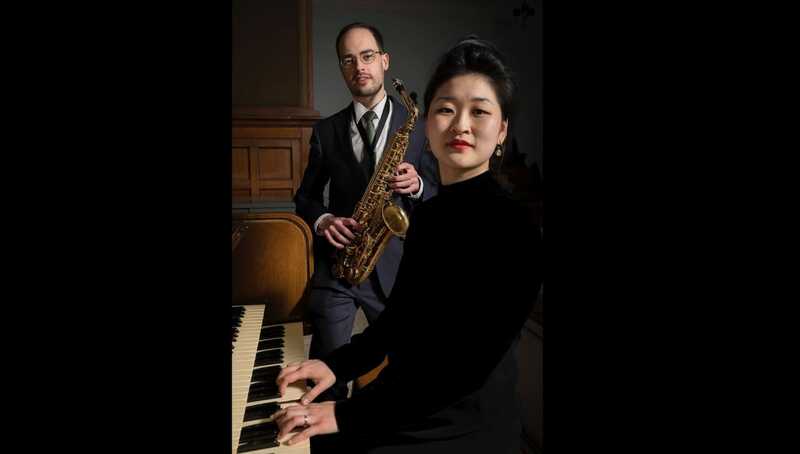 On Friday, Feb. 1, Performance Music at The University of Scranton will present a recital by the talented husband and wife team of saxophonist Jay Rattman and organist Janet Sora-Chung. The concert will begin at 7:30 p.m. in the Houlihan-McLean Center, Mulberry Street and Jefferson Avenue. Admission is free, with seating on a first-come, first-seated basis. In addition, Rattman will also offer a free woodwind masterclass the same day at 4:30 p.m. for student, amateur and professional musicians, age 16 and older. For masterclass registration, please email music@scranton.edu. Committed to showcasing works for saxophone and organ and transcriptions of other chamber pieces, the duo also creates and instigates the creation of new music for the combination. The evening’s program will include music by Kloppers, Couperin, Laurin, Hilse, Wheeler, Debussy, Bedard, and Rattman. A native of the Stroudsburg area, Rattman is a freelance improvisor, composer and woodwind multi-instrumentalist based in New York City. With a discography of more than 25 records that includes “Urbanus” by Stefon Harris, nominated for the 2010 Best Contemporary Jazz Album Grammy, and “New Celebration,” the last big band album by NEA Jazz Master Phil Woods, Jay’s musical sensitivity and spontaneity have placed him in demand in a wide range of settings from contemporary classical chamber music to early jazz, klezmer, creative improvised music, straight ahead jazz and everything in between. His film work includes the recently released second season of the award-winning TV series “The Marvelous Mrs. Maisel.” He has also performed at most of the major jazz clubs in New York in addition to the MoMA, the Coachella Festival, Red Rocks Amphitheater, the Late Show and the Tonight Show. Originally from Edmonton, Alberta, Dr. Chung is director of music at St. John’s Lutheran Church, New York City, and a frequent organ recitalist here and abroad. Dr. Chung earned her Doctor of Musical Arts degree at the Manhattan School of Music where she was recipient of the President’s Award and the Bronson Ragan award for most outstanding ability in organ performance. Her performance teachers include McNeil Robinson, Walter Hilse, Marnie Giesbrecht and Jacobus Kloppers, and pedagogy teacher Carol Ann Aicher. As an organ soloist and accompanist, Dr. Chung has performed at St. Mary the Virgin, St. Ignatius of Loyola Church, Riverside Church, SUNY Purchase Performing Arts Center and the Winspear Centre in Edmonton. Dr. Chung has a passion for performing the works of Messiaen, Bach and Rachel Laurin. For further information on the recital or masterclass, call 570-941-7624, email music@scranton.edu or visit scranton.edu/music. For more information on Rattman and Chung, visit jayrattman.com and janetsorachung.com.